17 September 2013, at 12:00a.m. Apollo Saku is a farmer, agricultural academic and project leader for Planting for Hope Uganda, a sustainable wealth-creation programme aimed at empowering rural communities through farming and cooperative schemes. Along with the Planting for Hope team, Apollo Saku is teaching the Kititi and Bukunda people to farm sustainably and market produce and crafts through cooperatives. The land currently under his stewardship lies to the west of Lake Victoria in the Kyanamukaaka region in the Masaka District of south west Uganda. Apollo is currently expanding his pig unit. This is so more manure can be taken onto the fields to fertilise the arable land. This is key to success. The farm enterprises co-exist and benefit from each other. The arable land grows fodder crops for the pigs which then produce fertiliser to nourish the next year's harvest. Eyes are on the weather at the moment as the second rotation of crops become established for the year. Apollo and the villagers prepare land manually, there is no mechanization. 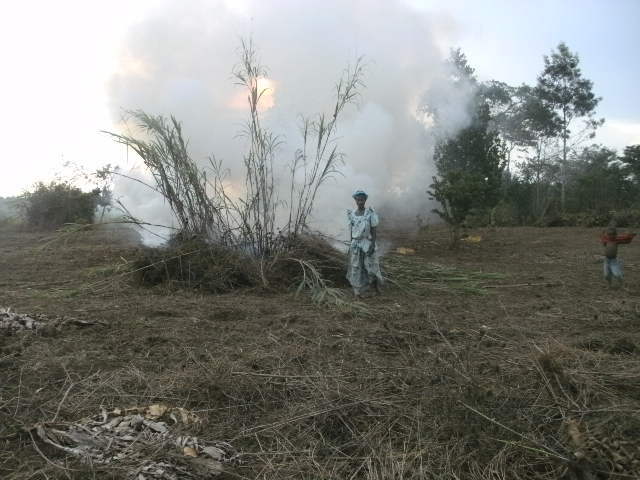 First of all a ‘slash and burn’ clearance method is used to clear land for crop growing or fodder for livestock. Basic hoeing has been used this August and into September to till the land. 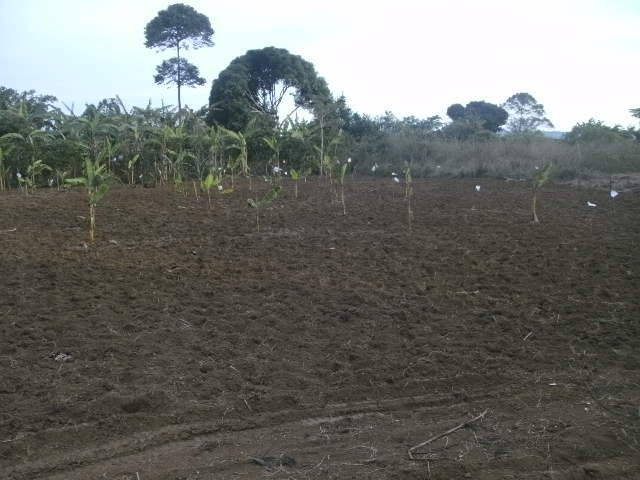 Holes are then dug at least three feet apart in which beans or maize is planted. Vegetable growing also extends to cabbages, onions, carrots and green pepper. These are grown in ‘double-dug beds’. The Ugandan climate has to deliver the right weather for good yields and crop establishment. Apollo aims for two plantings each year. This month, Apollo's farm budgets are factoring in new equipment. Apollo is in need of implements to work land and control weeds, as well items to help the livestock enterprises. A watering can costs 30,000 in Ugandan shillings (UGX), equivalent to US$11.80. One wheelbarrow is needed but this is UGX120,000, equivalent to $47. A knapsack sprayer is also on the wish list. This will distribute herbicide. Apollo says this is UGX150,000 - about $59. The farm’s pigs are progressing well with sows expected to farrow shortly. Between eight and ten piglets can be expected from the pigs. Pork is seldom eaten by Ugandan peasant farmers. Instead, people have to wait for Easter or Christmas to slaughter an animal for a feast. European breeds are crossbred as the native breeds are hardy but slow growing. Commercial pig farmers buy expensive maize bran with additives but Apollo explains that peasant farmers cannot afford this, instead growing native forage crops on the farm. "Feeding varies a great deal here," explains Apollo. "Commercial pig feed includes fish meal, cottonseed cake, lime, sunflower and premix. "However, peasant farmers are restricted to fattening pigs on food left-overs, weeds and washing water." Medicine and feed has been bought in. Apollo says this is thanks to donations from the Aspire Business Partnership LLP, based in the UK. Building up pig numbers is important to the programme. 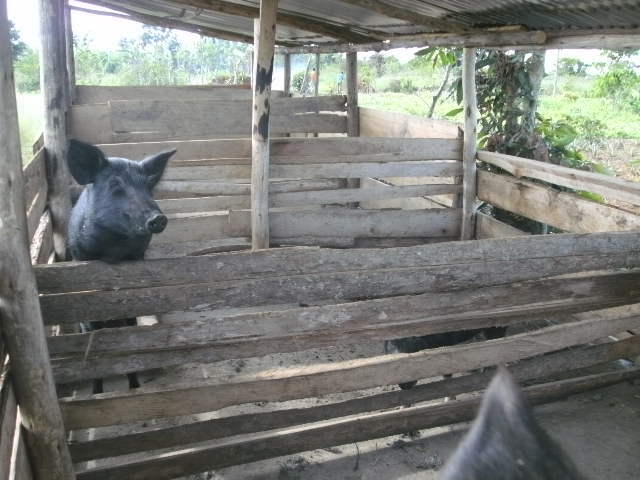 Villagers can get a pair of pigs if a boar and a gilt can be kept. Apollo describes pork as the main meat in the area and markets are ready to accept their pork all over the Masaka district. However, current meat sales are lower, due to the pig retention programme. To find out more about Apollo and his farm in Uganda, click here or contact Kate Oakley at kateoakley135@btinternet.com.